For a while now I’ve been focusing on a number of different technologies on Azure outside of my usual focus on mobile development. Today, I decided it would be a good idea to share some of the stuff I’ve learned. In this post, I’m going to walk-through how you can get started on Azure with Node.js applications. I’m going to go through this as though you’re setting up a new computer, so some of the steps might prove to be unnecessary for you. If you haven’t installed Node, Git, or Visual Studio Code (or whatever editor you prefer) yet, proceed on to the Setup. If you’re ok with skipping those steps, go jump to Creating your First Node App. In this section, we’ll talk through installing a number of tools. For the sake of this guide, I’ll be doing most of the steps assuming that you’re using OS X or Linux. The steps should be similar if you’re on Windows (though if you are, I’d recommend taking a look at the Node Tools for Visual Studio. First we’ll need to install Node. If that comes back with command not found you’ll probably need to install Node. You can do so by visiting the Node.js homepage and downloading the correct version for your OS. It’s probably a good idea to update your version of Node if you’re running an older version. The following commands will perform that update, however, it should be NOTED that this can mess things up on complicated Node installs. If you’re at the point where you have a complicated Node set up, hopefully you’ve skipped on to creating your first Node App anyway. If you don’t have Git installed, you can grab it from the Git homepage. If you’ve done a lot of Node development already, chances are good you already have a development environment you like to use. If that isn’t the case, I’d highly recommend Visual Studio Code. Code is a lightweight code editor with intellisense, code assistance, navigation, and debugging built-in. This editor works on OS X, Linux, and Windows, so no matter where you’re developing you can use it. Head to the Code homepage and grab the installer for your platform. Now that you have all the prereqs installed, let’s create our first app on Azure. Now, we could choose to create a local app first, then upload that to Azure, but today we’ll do things in a slightly more easy manner. I’ll post a followup article walking through creating a local site and putting it on Azure later (as there can be a few other steps). We’re going to start things off from the Azure portal. 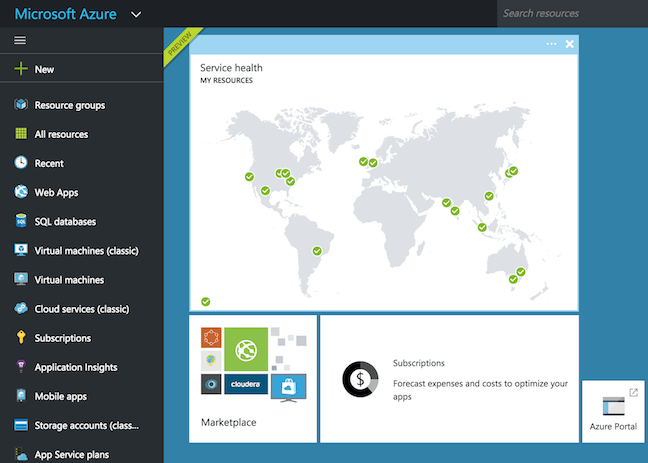 If you don’t already have an Azure account, you can sign up for a Free Azure Subscription here. Don’t worry, everything we’re going to do today is in the free tier of Azure so even if you’ve already used the free trial benefits of Azure, our web application won’t cost a thing. If you haven’t used Express before, it’s a minimal web application framework for Node.js. After clicking Create you’ll be asked to name your app as well as pick an App Service Plan/Location and a Resource Group. Click on the App Service Plan and this is where you can select what tier you want to run in (as well as the location). To ensure you’re staying within the Free Tier, select the Pricing Tier and then click View all at the top right. At the very bottom you’ll see the F1 Free tier which runs on shared infrastructure (and does not allow custom domains). Select that (or go ahead and select something else if you’re planning on paying). Finish by naming your App Service Plan and choosing a location. Next you can specify a Resource Group which is just a logical collection of resources. This is useful if you want to check billing and usage for a specific group, limit access and roles to those groups, as well as a few other reasons. When that’s all done, click Create. Those blades will close and after your app is created, you’ll be taken to the blade for it. And that’s all it takes to get our Node site running. You can read through the individual lines to understand what’s going on specifically but concisely, we’re telling IIS (which is what is running our web app) to run Node and run the server.js file. That should start your application listening on port 3000. So go to the browser and navigate to http://127.0.0.1:3000 and you should see the same web site running. git commit -m "Modifying the index"
You can also click on that deployment and see a log of the deployment steps as well as redeploy older versions. Today we went from zero to having Node, Git, and Visual Studio Code installed. 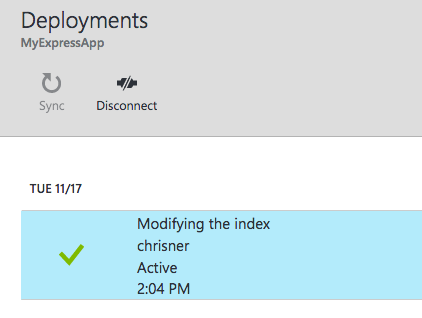 We also deployed a new Node.js Express app into Azure, pulled the code down, made local changes, and redeployed it using Git. All of this in only a matter of minutes and without having to do anything complex. From here though, the sky is the limit in what you can build. Additionally there are a LOT of features of Web Apps that we didn’t look at. A great way to get started with understanding some of the other built-in features is to scroll down the Settings blade in the portal.